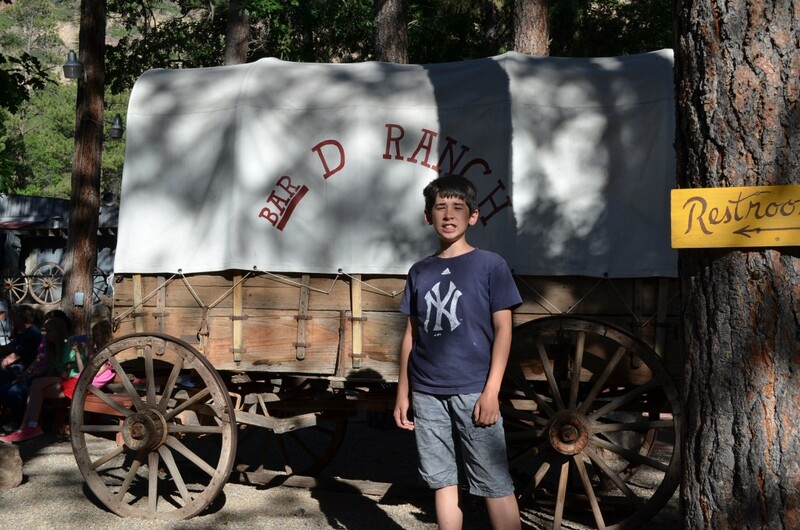 The Bar D Ranch is about 10 miles north of Durango and is a fun, family friendly activity. After our ride on the Durango & Silverton, we headed about 10 miles north of Durango (much of which was along the train route) to visit the Bar D Ranch. These types of ranches are popular tourist attractions throughout the southwest. There are several in Colorado, including the Flying W Ranch right here in Colorado Springs. Our family had never done something like this, so it was a completely new experience. We made reservations online ahead of time, which made check in very easy. We found our seats in the dining area (we were right up front, which you’ll find out wasn’t as great as it sounds) and then took off exploring other parts of the ranch. 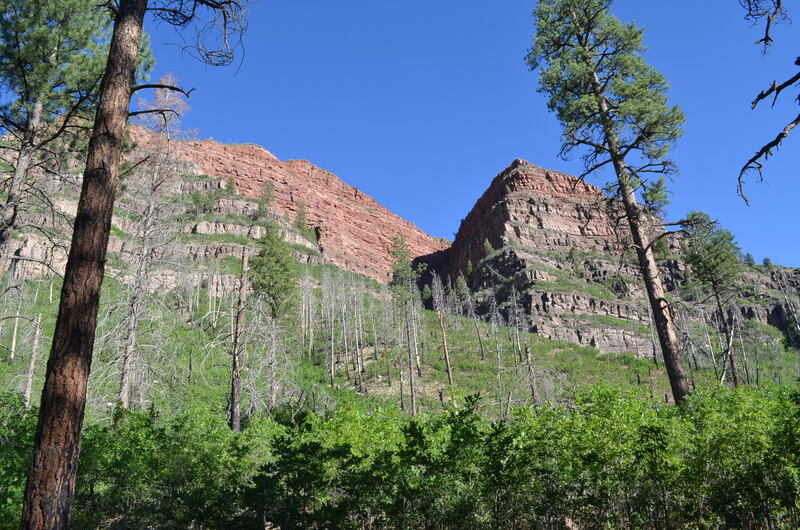 There’s a little train that goes around, and a playground for the kids right up against some beautiful rock formations. 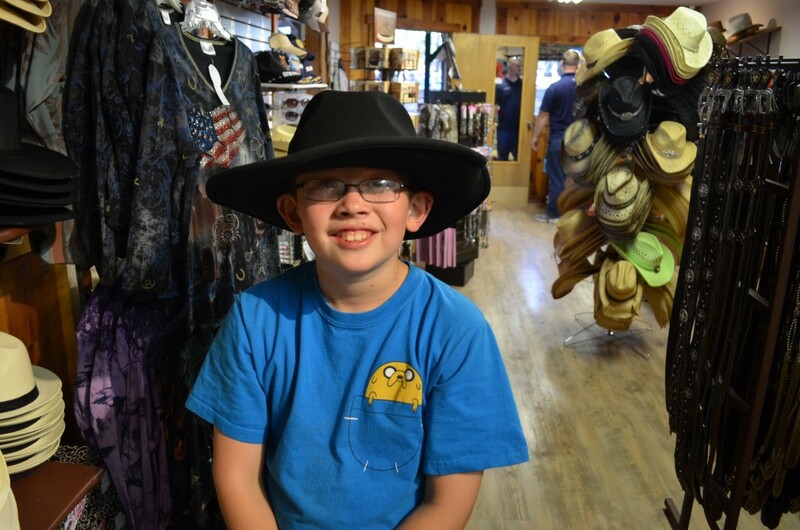 There’s a ton of souvenir shopping; not necessarily Bar D souvenirs, but typical western/cowboy items, such as belt buckles and cap guns for kids. 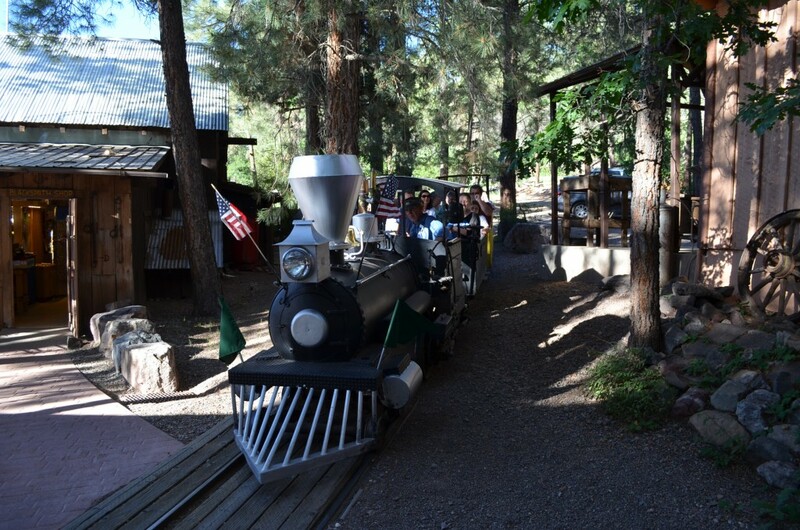 This cute little train made the rounds, giving a tour of the ranch. We did not ride the train, it was very popular. This picture was taken from the playground. Our sons made several new (albeit brief) friends on the playground. It was cute hearing them talking about where they were all from: Texas, California, Nevada, and my sons from Colorado. There are numerous western-themed souvenir shops. The kids really wanted cowboy hats, but I didn’t trust they’d wear them ever again after this vacation. A triangle is rung and we return to our seats for dinner. Even though we were sitting at table “A-1”, we were the very very very LAST table served. That was very very very upsetting to our sons, because we were famished from our days’ travels and I thought we were doing the right thing by making advanced reservations and arriving early enough to get put in good seats. It appeared that birthday parties, anniversary celebrations, and busloads of guest received the more central seating, and smaller parties were on the edges that ate later. There was plenty of food, but the line closed soon after we were served, so the opportunity to get seconds was short. How was the food? It was okay at best. Dave and I were reminded of Army “A-rations” that we had in the field and on deployments with the Army. Not bad, but certainly nothing gourmet. It is well-suited for serving the nearly 500 guests in about 30 minutes. The food line will meander through this building behind the picture of the chuckwagon supper on the wall. Any Army cook would be impressed with the speed and efficiency of the food service here. All 500 of us were served in about 30 minutes. Our table was dead last. After dinner, coffee is served and the entertainment begins. The Bar D Wranglers is a quartet of musicians who can perform an incredible variety of music: bluegrass, country, and even mariachi! They seemed to thoroughly enjoy performing for us, and are oh-so talented! Our family’s favorite song was called Matt Palmer’s Misfit Farm, a parody on Old McDonald. The entertainment show is worth every penny, even if you didn’t like the dinner. 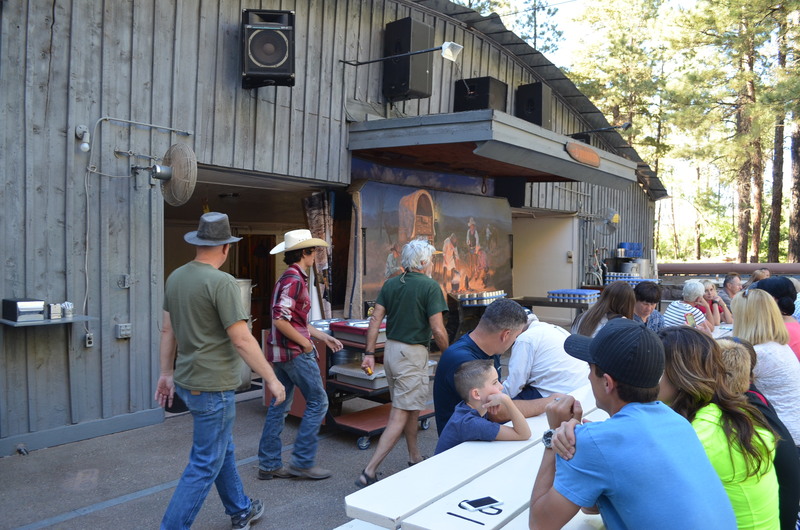 The Bar D Chuckwagon Supper show is performed nightly between Memorial Day and Labor Day. Reservations are highly recommended in the height of summer vacation season and can be made at the ranch’s website. No payment is required at reservation time, but the dinner show is $24 per adult and $10 per child aged 10 and under. At check in time you can upgrade to a ribeye steak for an extra $10. If you don’t make reservations, arrive very early to grab space-available seating.